Today I am going to be doing a post on a brand I've recently become familiar with and have been really impressed by, Oxo. Oxo produce over 800 innovative products that span across every room of the house and are all designed to make everyday living easier. They have three sub-brands which are Oxo Good Grips, Oxo SteeL and Oxo Tot and today I am going to be sharing a review of a Tot product and my wishlist for Grips items. The item I am reviewing today is the Oxo Tot Toddler Feeding Set suitable for ages 12 months +. 1. A plate with a non-slip weighted base and removable curved ring. This helps to keep food on the plate and not on the floor, once the child has master self-feeding they can remove the curved ring meaning the plate can continue to be used. 2. A 360ml bowl with a non-slip weighted base and high walls to make scooping onto utensils easy. 3/4. A fork and spoon, both with generous handles and non-slip grips without any sharp edges. They have a flat spot on the handles which prevents the cutlery from rolling off a table or highchair tray and is a nifty little feature. The plate and bowl are top-rack dishwasher safe and the utensils are completely dishwasher safe so nice and easy to clean. The items are all top quality and visually look very modern and different to what you would usually expect. I think for the pretty reasonable price tag of £18 for the four part set you get good value for money and it is definitely a set that you can use time and time again. Next, let's move on to the Good Grips range. As you guys may have seen from my social media updates I am currently on the Slimming World plan which means a lot of preparing food, introducing more fruit and vegetables to my diet etc. This is where food storage is becoming an essential part of my daily routine. 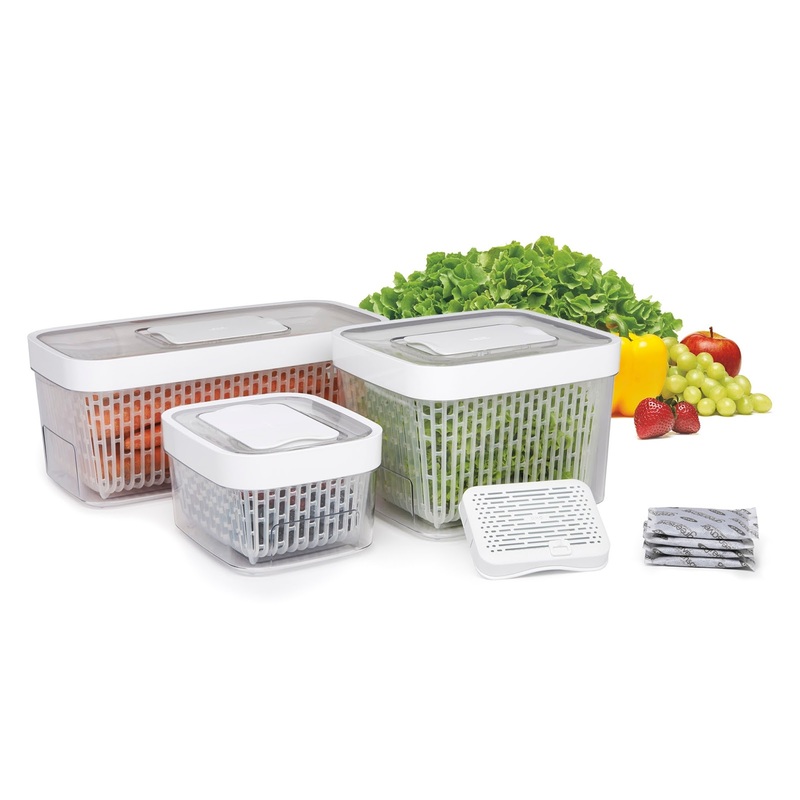 I have spied the produce keeper products on the Oxo website that I need to get, the containers have a all natural, non toxic activated carbon filter that traps and absorbs ethylene gas which slows down spoilage and keeps food fresher for longer. 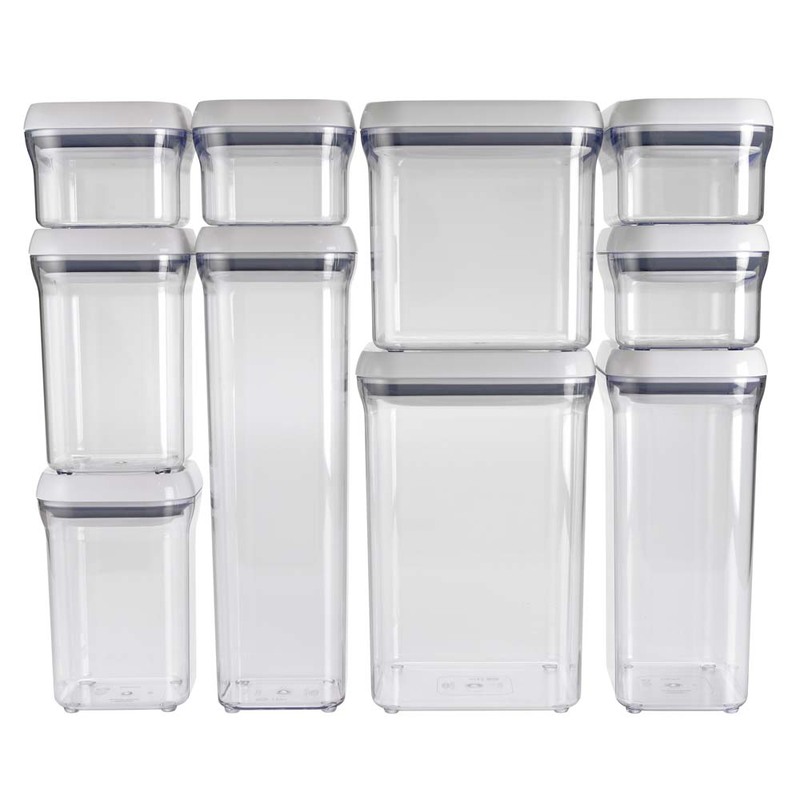 I think they will be perfect for keeping my fresh veg in when I refrigerate them. The baskets inside can also be used as a colander to rinse vegetables before cooking which is an awesome little feature. There is also a range of pantry and countertop canisters that would be really handy for storing things like pasta, pulses or cereal due to the air tight seals which keep everything dry and fresh. I can't wait to start building my collection of Oxo items, each and every one of them looks really modern and cool within your kitchen and has added little features. I think it is always worth investing in good quality homeware items that are going to make your food last longer and taste fresher. If you want to check out the full range you can do so on www.oxouk.com. Let me know any tips and tricks you have for storing food, I'd love to read them in the comments below.